The fight over a replacement for the late U.S. Supreme Court Justice Antonin Scalia is heating up this week, with plans for Senate Majority Leader Mitch McConnell, R-Ky., and Senate Judiciary Committee Chairman Charles Grassley, R-Iowa, to meet with Barack Obama over the issue. the 2nd part (in RED ). A judge in Cook County Circuit Court will hear testimony Friday in a lawsuit filed by an Illinois voter that alleges Republican presidential hopeful Ted Cruz should not be allowed to run for president, CNN and ABC are reporting. One major reason the Veterans Affairs Department can't fire troublesome employees: Bernie Sanders. The Obama administration is moving to undo the Democratic presidential candidate’s past work as Senate Veterans' Affairs Committee chairman in an effort to clean up the department, considering a change in employment rules for VA executives that Sanders fought for vigorously just two years ago. . Addressing common misconceptions about capitalism. 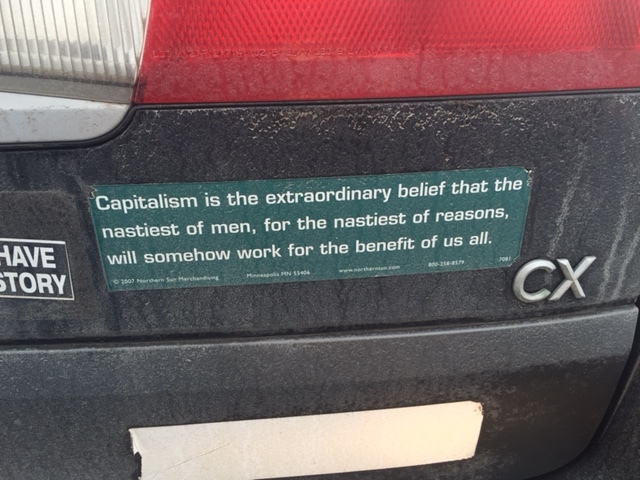 We’ve all seen a bumper sticker that make us shake our head, and it’s hard to know the intentions of the person who put it on their car, and whether they were misinformed or simply uninformed. The one I spotted the other day, however, jumped out at me as particularly ignorant. By now, Daniel had been in Afghanistan two months. It was July 2012, his third tour of duty and his first with Oogie, his military working dog. They were leading their platoon on yet another patrol, clearing a no-name village with maybe 15 houses and one mosque, when they began taking fire. Since Justice Antonin Scalia was found dead in his resort hotel room at Cibolo Creek Creek Ranch on Saturday, questions have been flying about the immediate declaration of “natural causes” as the means of death. According to the ranch owner, Scalia was described as “animated and engaged” during dinner Friday night. He was one of three dozen invitees to an event unrelated to law or politics. Since the Usurper Barry Soetoro is himself unconstitutionally in the White House, his two appointments, Sotomayor and Kagan, are equally illegitimately on the Supreme Court. If the next President is Republican is absolutely true to the Oath to Support and Defend the US Constitution, then he can remove the two illegitimate Associate Justices and then have 3 vacancies to fill on the Supreme Court. A prominent global-warming skeptic is marveling at a new NASA report that concludes the purported human-caused changes in the climate now, after years of being blamed for raising the sea level, is slowing down the rise. An influential member of the U.S. Senate wants Veterans Affairs Secretary Bob McDonald to stay on in that role next year, no matter who becomes president. Lawmakers could be headed toward a veterans omnibus bill covering a host of health, education and employment issues after House members passed a package of nine veterans-themed measures Tuesday evening. The flurry of legislation came after a day of debate and discussion about veterans issues on the House floor. All of the measures were passed by voice vote without objection, but will need Senate action and the president's signature before they can become law. A federal court had ordered the VA to reassess its policy denying Agent Orange benefits to Navy sailors who served in the Vietnam War. The VA’s conclusion: They still don’t qualify. JACKSON, Miss. — The U.S. secretary of veterans affairs said Friday that he stands by his appointment of a regional health care executive who was accused of misleading Congress about how long veterans waited to receive care at a VA facility where she worked in Los Angeles. Secretary Robert McDonald said he has "absolute confidence" in Skye McDougall to oversee veterans hospitals and clinics in Texas, Louisiana, Arkansas, Mississippi and Oklahoma. After battling a Missoula veteran’s disability rating for a traumatic brain injury for more than three years, the VA has finally blinked. “The VA’s Appeals Management Center conducted a records review inclusive of my prior neuropsychological test results conducted by the Department of Defense (Army) and determined those original test results were sufficient to overturn the VA’s initial rating decision,” Charles Gatlin said last week. The results are extremely clear. Sanders is a non-factor as he will be later disqualified for not being a true Democrat. With O'Malley dropping out, the nomination on the Democrat side is all Hillary. The Democrat race is over and done. She is the nominee.